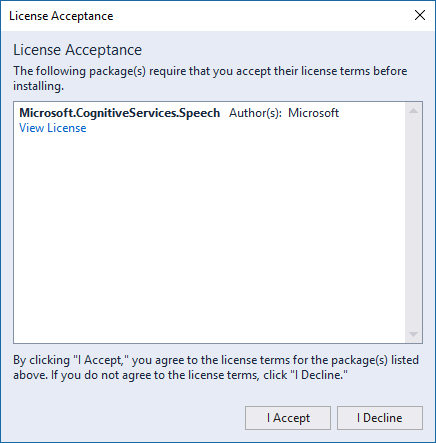 In this article, you develop a C# Universal Windows Platform (UWP; Windows version 1709 later) application by using the Cognitive Services Speech SDK. 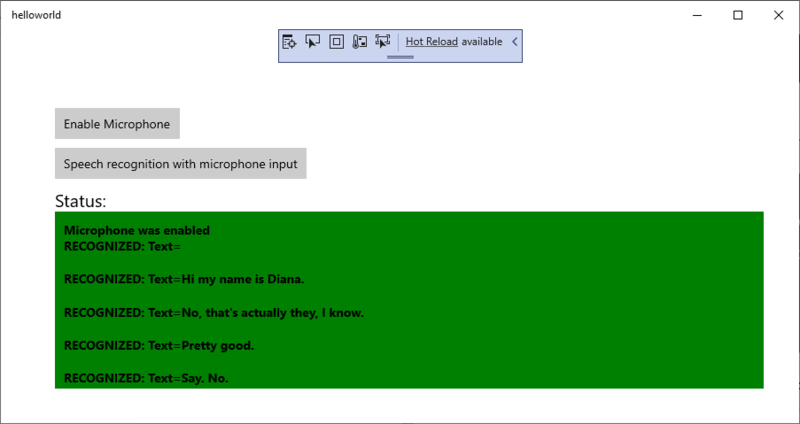 The program will transcribe speech to text in real time from your device's microphone. 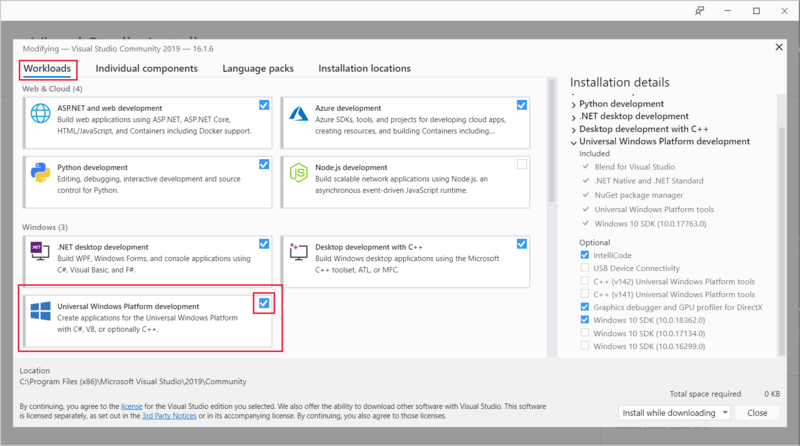 The application is built with the Speech SDK NuGet Package and Microsoft Visual Studio 2017 (any edition). The Universal Windows Platform lets you develop apps that run on any device that supports Windows 10, including PCs, Xbox, Surface Hub, and other devices. Make sure the Universal Windows Platform development workload is available. Choose Tools > Get Tools and Features from the Visual Studio menu bar to open the Visual Studio installer. If this workload is already enabled, close the dialog box. 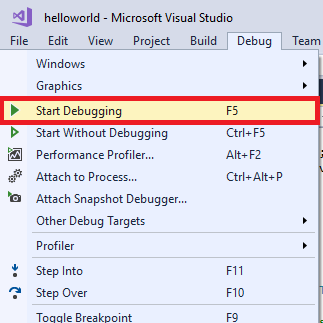 Otherwise, select the box next to .NET cross-platform development, and select Modify at the lower right corner of the dialog box. Installation of the new feature takes a moment. 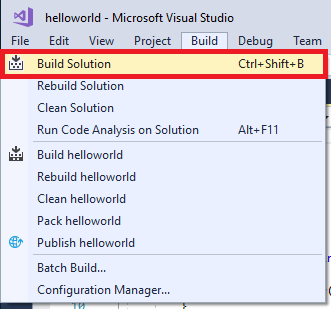 Create a blank Visual C# Universal Windows app. First, choose File > New > Project from the menu. In the New Project dialog box, expand Installed > Visual C# > Windows Universal in the left pane. Then select Blank App (Universal Windows). For the project name, enter helloworld. The Speed SDK requires that your application be built for the Windows 10 Fall Creators Update or later. In the New Universal Windows Platform Project window that pops up, choose Windows 10 Fall Creators Update (10.0; Build 16299) as Minimum version. In the Target version box, select this or any later version, and then click OK. The Speech SDK only supports Intel-compatible processors. ARM is currently not supported. 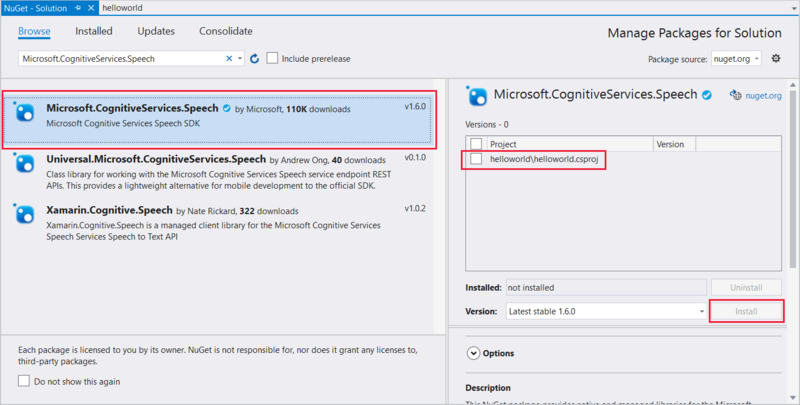 Install and reference the Speech SDK NuGet package. 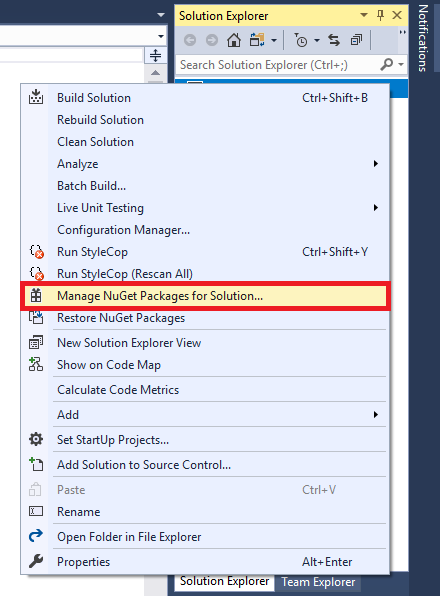 In Solution Explorer, right-click the solution, and select Manage NuGet Packages for Solution. The following output line appears in the Package Manager console. Because the application uses the microphone for speech input, add the Microphone capability to the project. In Solution Explorer, double-click Package.appxmanifest to edit your application manifest. Then switch to the Capabilities tab, select the box for the Microphone capability, and save your changes. 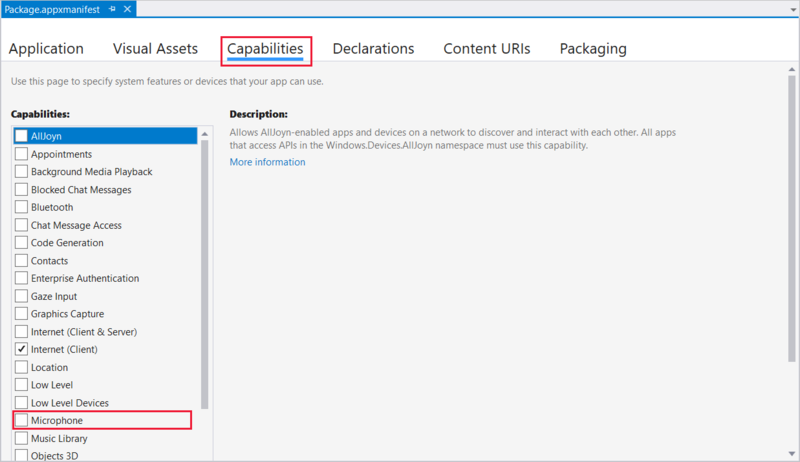 The application's user interface is defined by using XAML. Open MainPage.xaml in Solution Explorer. In the designer's XAML view, insert the following XAML snippet into the Grid tag (between <Grid> and </Grid>). Open the code-behind source file MainPage.xaml.cs (find it grouped under MainPage.xaml). Replace all the code in it with the following. // Creates a speech recognizer using microphone as audio input. // If called from the UI thread, then update immediately. // Otherwise, schedule a task on the UI thread to perform the update. // Collapse the StatusBlock if it has no text to conserve real estate. // Raise an event if necessary to enable a screen reader to announce the status update. In the SpeechRecognitionFromMicrophone_ButtonClicked handler in this file, replace the string YourSubscriptionKey with your subscription key. In the SpeechRecognitionFromMicrophone_ButtonClicked handler, replace the string YourServiceRegion with the region associated with your subscription (for example, westus for the free trial subscription). Save all changes to the project. Build the application. From the menu bar, select Build > Build Solution. The code should compile without errors now. Start the application. From the menu bar, select Debug > Start Debugging, or press F5. A window pops up. Select Enable Microphone, and acknowledge the permission request that pops up. Select Speech recognition with microphone input, and speak an English phrase or sentence into your device's microphone. Your speech is transmitted to the Speech Services and transcribed to text, which appears in the window.